Download "Nokia Maps for Mobile Web"
2 2 About Nokia Maps for Mobile Web About Nokia Maps for Mobile Web Experience Nokia Maps on your non-nokia phone. Find new places from all over the world, and learn how to get there. You can: Search for addresses, places of interest, and services Create routes, and get turn-by-turn directions on foot, by car, or when using public transport Get voice guidance when walking Get linked to the latest info on what there is to see and do, and where to spend the night To use the service on your touch screen phone or tablet PC, your device must support HTML5 (for example, ios 4.3+, Android 2.2 or 2.3, or Blackberry 6.0+). 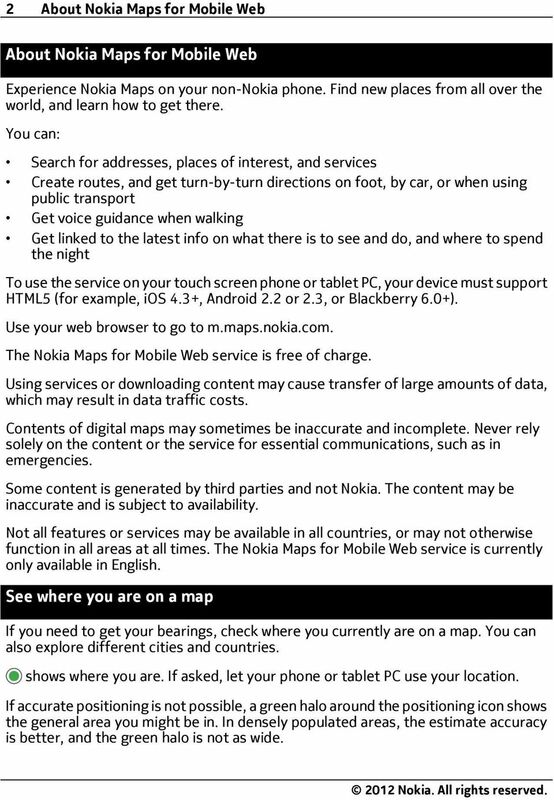 Use your web browser to go to m.maps.nokia.com. The Nokia Maps for Mobile Web service is free of charge. Using services or downloading content may cause transfer of large amounts of data, which may result in data traffic costs. Contents of digital maps may sometimes be inaccurate and incomplete. Never rely solely on the content or the service for essential communications, such as in emergencies. Some content is generated by third parties and not Nokia. The content may be inaccurate and is subject to availability. Not all features or services may be available in all countries, or may not otherwise function in all areas at all times. 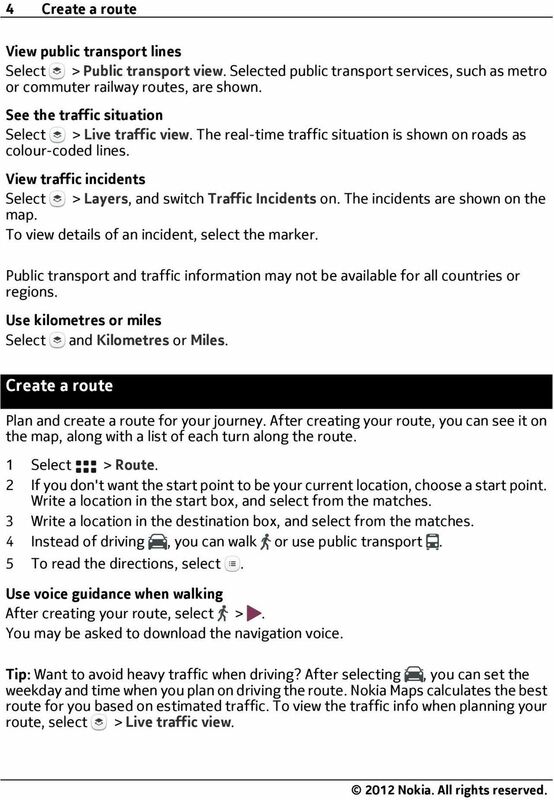 The Nokia Maps for Mobile Web service is currently only available in English. See where you are on a map If you need to get your bearings, check where you currently are on a map. You can also explore different cities and countries. shows where you are. If asked, let your phone or tablet PC use your location. If accurate positioning is not possible, a green halo around the positioning icon shows the general area you might be in. In densely populated areas, the estimate accuracy is better, and the green halo is not as wide. 3 Search for a location 3 Explore the map Drag the map with your finger. The map is oriented north. See where you are right now Select. Zoom in or out Select or. On ios, place two fingers on the map, then slide your fingers apart or together. See the address of a location Tap and hold the location. Map coverage varies by country and region. Search for a location You can search for locations, such as street addresses, and places, such as restaurants. Write the search words in the search box. See the details of a found place Select the address pop-up. You can use the details page of a found location to easily navigate to the place, see its contact info, or save or share the location. 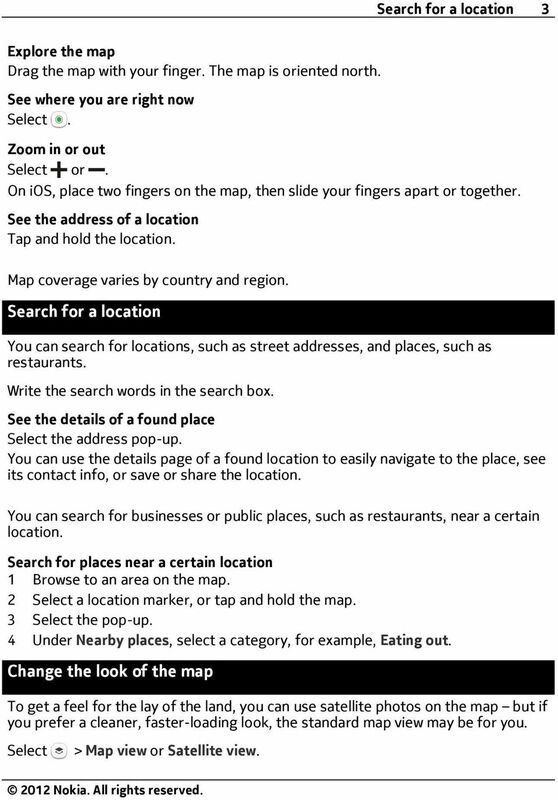 You can search for businesses or public places, such as restaurants, near a certain location. Search for places near a certain location 1 Browse to an area on the map. 2 Select a location marker, or tap and hold the map. 3 Select the pop-up. 4 Under Nearby places, select a category, for example, Eating out. Change the look of the map To get a feel for the lay of the land, you can use satellite photos on the map but if you prefer a cleaner, faster-loading look, the standard map view may be for you. Select > Map view or Satellite view. 4 4 Create a route View public transport lines Select > Public transport view. Selected public transport services, such as metro or commuter railway routes, are shown. See the traffic situation Select > Live traffic view. The real-time traffic situation is shown on roads as colour-coded lines. View traffic incidents Select > Layers, and switch Traffic Incidents on. The incidents are shown on the map. To view details of an incident, select the marker. Public transport and traffic information may not be available for all countries or regions. Use kilometres or miles Select and Kilometres or Miles. Create a route Plan and create a route for your journey. After creating your route, you can see it on the map, along with a list of each turn along the route. 1 Select > Route. 2 If you don't want the start point to be your current location, choose a start point. Write a location in the start box, and select from the matches. 3 Write a location in the destination box, and select from the matches. 4 Instead of driving, you can walk or use public transport. 5 To read the directions, select. Use voice guidance when walking After creating your route, select >. You may be asked to download the navigation voice. Tip: Want to avoid heavy traffic when driving? After selecting, you can set the weekday and time when you plan on driving the route. Nokia Maps calculates the best route for you based on estimated traffic. To view the traffic info when planning your route, select > Live traffic view. 5 Save a place 5 Save a place Before a trip, you might find it handy to save info about hotels, attractions, or petrol stations to your phone. 1 Select a location marker, or select and hold a location on the map. 2 Select the pop-up. 3 Select. View a saved place Select > Favourites. Remove a place from your favourites Select. Sync your saved places Have your favourite places always backed up and at hand sign in to your Nokia account to sync your favourites with the Nokia Maps website. Select >, and sign in to your Nokia account. Your favourites are synced automatically. To sync your saved places manually, select > >. 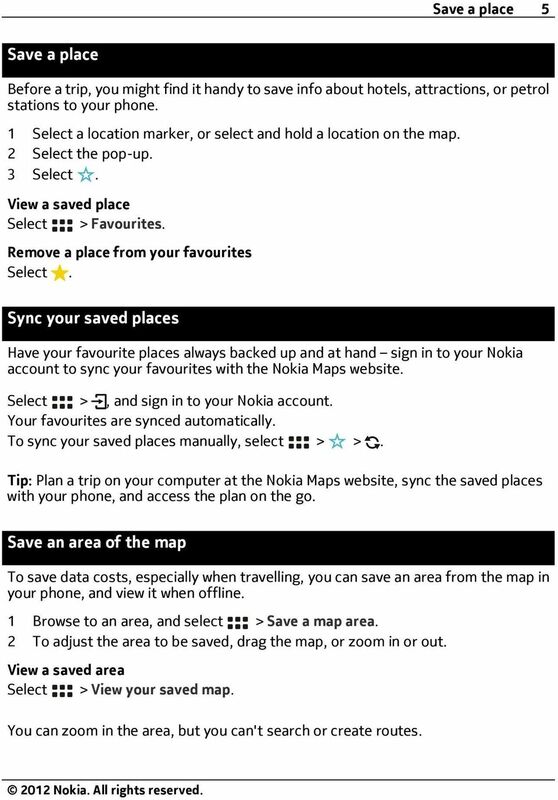 Tip: Plan a trip on your computer at the Nokia Maps website, sync the saved places with your phone, and access the plan on the go. Save an area of the map To save data costs, especially when travelling, you can save an area from the map in your phone, and view it when offline. 1 Browse to an area, and select > Save a map area. 2 To adjust the area to be saved, drag the map, or zoom in or out. View a saved area Select > View your saved map. You can zoom in the area, but you can't search or create routes. 6 6 Share your location Share your location Let your friends know where you are and what you're doing share your location on social networking services. You need a social networking service account. The supported social networking services may vary by country or region. 1 Select a location marker, or select and hold a location on the map. 2 Select the pop-up. 3 Select and a social networking service. 4 If needed, sign in to the service. 5 You can write a comment for the link you are sharing. Important: Before sharing your location, always consider carefully with whom you are sharing. 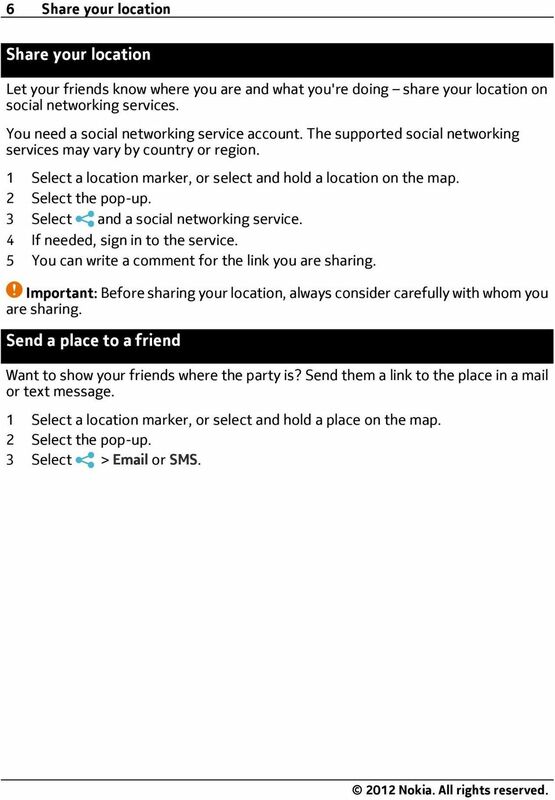 Send a place to a friend Want to show your friends where the party is? Send them a link to the place in a mail or text message. 1 Select a location marker, or select and hold a place on the map. 2 Select the pop-up. 3 Select > or SMS. 29/07/2015 mymcs Mobile apps APP INSTALLATION GUIDE 1 Product Map 2 Installation MYMCS MOBILE APP INSTALLATION GUIDE 3 What is an app? An app is a stand-alone file which can be installed on your device. Visit your Google Play or App Store and search for Right Move Perth. The App is FREE to download.